A veritable storm broke out in May, 2013 when Adobe announced the switch to an annual subscription service. Things have now settled down, and a monthly fee of A$9.99 seems quite reasonable for a service that always lets you have access to the latest version of Photoshop, especially now that Adobe throws Lightroom CC into the deal as well. However, Adobe left the door open for people who prefer the standalone version of Lightroom, which is now Lightroom 6. This has the advantage of giving you a perpetual licence, but you will need to pay for an upgrade once Lightroom 7 comes along. The latest Lightroom 6 and Lightroom CC both share most of the new features, but there are subtle differences. The Creative Cloud subscription has all the periodic upgrades available instantly. You can also synchronize photos to Lightroom on your mobile devices, and access shared images through Lightroom from a web browser. A cool feature is the option to create online portfolios utilizing the Behance online service, as well as a raft of additional benefits all included as part of your Creative Cloud subscription. As we walk through the latest Lightroom features I will point out any differences between the two versions of Lightroom. This was definitely my favourite when I first installed Lightroom CC. The only hint you get about this new feature is the face icon in the toolbar, between the thumbnails and the film strip. This is the first time that Adobe has included a face detection and recognition tool into one of its professional applications (it has been part of Elements for a long time). Even if you are not a big fan of face recognition, you can’t help but be impressed by how well it works, and how it integrates into the other library functions in such a straightforward manner. Lightroom can scan your entire catalogue of faces, but that will take a long time. You might want to search a single folder or collection at a time. The program identifies faces and automatically groups similar faces together. Of course, you first need to tell it who these people are, but the more you use this feature the more it will be able to suggest names automatically based on the experience it has gained in the past. Any new faces will come up in the Unnamed People panel at the bottom. Depending on past experience, Lightroom will have a guess and display a name with a question mark that you need to confirm, or if it’s inaccurate you can type in a different name. As you assign names to the faces, they move up into the Named People panel. Lightroom groups similar-looking faces right from the start, displaying them as a single thumbnail, so you won’t need to name every photo, but only the whole group. No face-recognition system is perfect, and occasionally Lightroom will pull out sections of an image that aren’t faces at all. All you need to do is click on the ‘X’ box to remove them. You might have expected to find a new ‘people’ attribute or metadata category for performing searches or creating smart collections. However, it turns out that Lightroom identifies people as keywords. In order to find people in your library you need to do a text search for their name. According to Adobe, the people keywords are treated differently to other keywords. To help maintain privacy those keywords are removed before exporting or sharing the photo, unless you choose to override this default setting in the Export dialogue. Another great new feature is the ability to merge HDR and panorama shots. In the past you needed to exit Lightroom and make a trip into Photoshop. HDR images can be tricky to get right. Shooting them in RAW doesn’t really help, because you need to optimize each shot and convert individually before blending. But how should you optimize a RAW file that is underexposed or overexposed by several stops? The latest Lightroom does make this alarmingly simple. All you need to do is select the images in your exposure series and go to Photo > Photo Merge > HDR. You will get a dialogue box with a few simple choices, which keep the technicalities to a minimum, yet will reward you with excellent results. You can check the Auto Align box to make sure that Lightroom adjusts any misalignment between images, especially if your HDR series was done handheld. The Auto Tone function will do its best to correct the contrast and brightness in the combined image. The deghosting option will take care of moving objects between frames, such as leaves, birds, or passers-by. You get the choice of different deghosting settings, and the preview will tell you which option gives you the best result. Lightroom lets you see the deghost areas with a red overlay. Not surprisingly, in my example the water in the lake caused some problems, but there was nothing visible in the final result. Once you hit the merge button you may need to wait a minute or so, but the results are really impressive. Instead of a lurid, artistic-looking HDR image with dramatic tonal contrast and glow effects, Lightroom produces a very realistic image with all the shadows and highlights intact, without unrealistic tonal compression or flattened contrast. Image 5 shows you the end result. The three originals were taken handheld, and two stops apart. The beauty of the process is that the resulting image is still a RAW file, with all the flexibility offered by the RAW conversion. 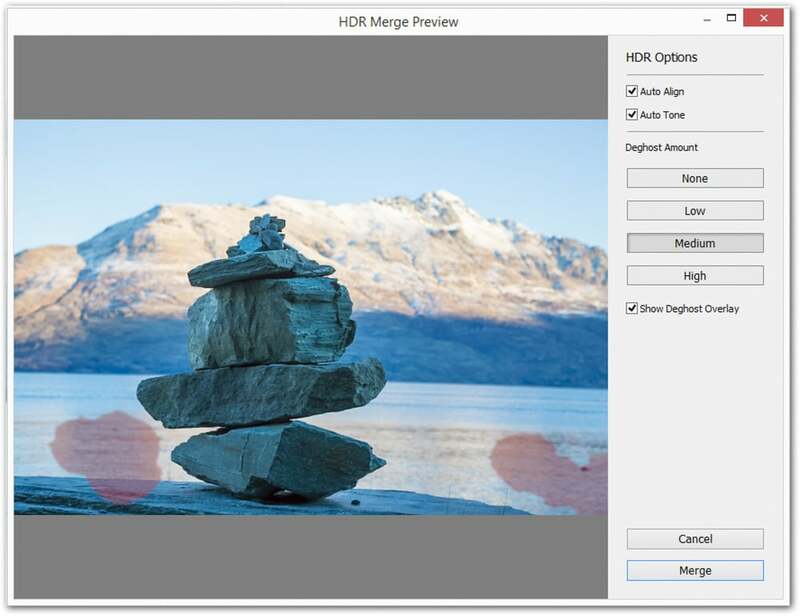 You will find the file stored with the original file name plus the suffix ‘–HDR.dng’. The Panorama Merge works similarly, and could hardly be simpler. Once you have selected the series of shots, you choose the Panorama option from the Photo Merge menu. Photoshop presents you with a fairly complex list of different layout options, whereas Lightroom just gives you three different ‘projections’. And that’s really all you need. You can leave it on Auto Select Projection and let Lightroom do the rest. At the end Lightroom gives you the option to auto crop your panorama. The stitching process will leave ragged blank areas at the edges, which can be cropped to a perfect rectangular image. Note that Photoshop offers you the option of filling those areas in with its content-aware technology, whereas Lightroom does not (yet) have this ability. You won’t find any major additions or changes to the adjustments available in the Develop module. In fact, the latest process version is still 2012. However, the latest Lightroom editions do offer an enhanced control over the masks you apply with targeted adjustments. The previous version of Lightroom introduced targeted adjustments: the Graduated Filter — for transitions along a linear gradient — and the Radial Filter, which lets you apply tonal adjustments either to the centre or to the edges of a photo. You also had the Adjustment Brush for painting customized areas to give them some tonal variety of your choice. What Adobe offers you in the latest version is to combine the effects of the Graduated or the Radial Filter with the Adjustment Brush. Let’s consider a fairly common scenario: you want to darken a bright sky to enhance the details of the clouds. The horizon is pretty straight, so you will reach for the Graduated Filter. However, there is a building or a mountain jutting into the sky, and you don’t want to darken those features. In the past, this necessitated a trip to Photoshop. In the latest Lightroom you grab the brush option from the mask settings on top of the controls for the Graduated Filter, and simply paint to add (or subtract) the adjustment into the areas that were excluded based on the gradient. Another new feature is that it is now possible to move the ‘pins’ created by the Adjustment Brush. Previously, these were placed permanently at the point where you started brushing. Best of all, both the gradient mask and the painted areas are kept as independent mask areas that you can refine at any time in future. To get a better grip on the effect you’re trying to achieve, you can exaggerate your adjustment at first so that you can judge which areas are being affected. Or you can turn on the Show Selected Mask Overlay checkbox on the toolbar. There are many more enhancements in the new Lightroom that I lump under one heading. Some of them might be major improvements for you, depending on your work flow and preferences. Lightroom now lets you add photos to a collection during import, or even create a new collection as part of the process. There are performance improvements when Lightroom utilizes your computer’s graphics processing unit (GPU) for image-intensive tasks, so the main processor isn’t shouldering as much of the load. Performance depends on your hardware, and you can see the difference if you go into your preferences and switch off the Use Graphics Processor option in the Performance tab. It will be on by default. The slide-show department has also received a major revamp. A show now can include up to 10 soundtracks, which should prevent some annoying earworms from developing during a show. The slide transitions can be synced to the beat of the music with the new Sync Slides to Music checkbox. You’ll also find an Audio Balance slider to let you choose which audio is dominant when you include video clips in the slide show. Where the transitions between slides is still limited to a simple dissolve, there is now a Pan and Zoom option to present your shots in a more dynamic fashion. Last but not least I want to mention the all-new Dehaze function. It works like the Clarity adjustment on steroids. You really need to experience this control yourself to appreciate its power. Interestingly, Adobe didn’t lump the new slider together with the Clarity control in the Basic section, but you’ll find it under Effects, below the Grain controls. Any positive settings will reduce the appearance of haze in your photo, but by dragging the slider to the left you can add haze to an image just as well. If you look for the Dehaze control in your stand-alone Lightroom 6, you’ll be out of luck — Adobe added this function only to the Creative Cloud version. We need to assume that this approach is aimed at encouraging photographers to switch to the subscription-based CC plan. Adobe Lightroom was originally designed as a professional image-cataloguing program to be used alongside a regular image editor, such as Photoshop. You’ll still need Photoshop for layers, montages, masks, and other heavy-duty manipulation, however, over the years Lightroom’s editing tools have become more and more sophisticated, and in most cases Lightroom is really all you need, not to mention it has all the output options that you won’t find in Photoshop.